For many of us Westerners, Japanese beer translates to pretty much one thing: frothy, crystal clear adjunct lagers like Sapporo, Kirin, and Asahi, downed by the pint alongside sushi, salty shrimp tempura, and steamy, hangover-curing bowls of tonkotsu ramen. And while there’s nothing wrong with indulging in the wasabi-tempering powers of mass-produced light beer, curious drinkers will be happy to learn that the land of sake and shochu is also home to an increasingly vocal crop of ultra-creative microbrewers dedicated to putting a new face on their country’s beer reputation. And these innovators aren’t just making great beer, they’re redefining the category itself, experimenting with native ingredients and methods while maintaining a sky-high level of quality and craftsmanship. If the idea of fish beer is turning you off, think again. Perfectionism is integral to Japanese business culture and even the most offbeat craft breweries aren’t immune to these standards. That means that just about every bottle you come across has been painstakingly refined and manufactured to please. According to a 2018 report from the Tokyo Agricultural Trade Office, Japan’s domestic craft beer consumption has quadrupled over the last decade, with 174 breweries producing 47,262 kiloliters of suds annually. And lucky for you, overseas distribution is also on the rise. Many of the archipelago's top brands, including the five standouts below, have set sail for American shores, washing up in cities across the country and bringing a fresh taste of their homeland along with them. Time to get thirsty. If you’ve only heard of one Japanese craft outfit, odds are it’s Hitachino. 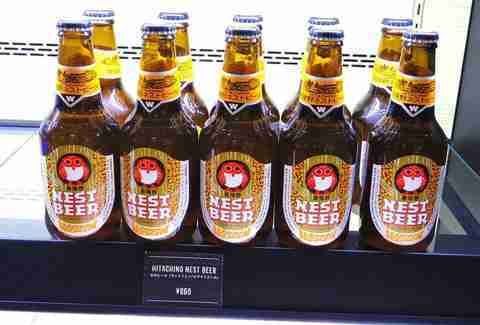 For the last 30 years, dark brown bottles adorned with the brand’s adorable red owl logo have been popping up at beer bars, Asian restaurants, and liquor stores from coast to coast to much fanfare. So much fanfare that, according to the brewery, they export 50% of their stock to the US and England. But if you’ve only ever sampled the flagship White Ale -- the overwhelming favorite, it alone accounts for 50-60% of the brewery’s total production -- you ain’t seen nothin’ yet. The iconic company started as a family-run sake brewery back in 1823 and began adding beer to their repertoire in the mid-nineties as Japanese alcohol laws began to ease. Since then, they’ve consistently put out some of the country’s most experimental and exciting brews, winning awards and gaining loyal customers all over the globe by choosing to focus on unique native ingredients instead of reinventing the hop bomb-crazed Western wheel. And they’ve even started playing around with distilling, installing a small still along with a few racks of oak barrels in a loft above the Naka brewery’s massive warehouse in Ibaraki Prefecture. Highlights from their line of 15+ core and seasonal releases include DaiDai Ale, a fragrant, deliciously pithy IPA dry hopped with a rare species of indigenous mandarin oranges called Fukure Mikan; Yuzu Lager, a 5% ABV beach crusher spiked with layer upon layer of fresh grapefruit-tinged yuzu juice; a tart, refreshing and surprisingly complex gose brewed with sour Japanese plums and mineral-charged seaweed salt named Anbai Ale; and the coral-hued Red Rice Ale, which gets its distinctive color, touch of acidity, and delicate composition from the addition of ancient Asamurasaki rice. For something a little heavier, look out for Nipponia, an 8% ABV Belgian-style golden ale made with locally-harvested Kaneko Golden barley malt -- a long-forgotten variety the brewery helped revive in recent years -- and Japan’s own Sorachi Ace hops, beloved for their zesty, lemony essence. This charming Ichinoseki outpost also started out as a sake brewery and has since expanded to a full-scale restaurant, cafe, history museum, and craft beer brewery responsible for cranking out a vast assortment of highly inventive, regionally-sourced brews under the name Iwate Kura. Inspired by the prefecture’s lush, picturesque expanse, many releases revolve around offbeat ingredients like cherry blossoms, sancho peppers, persimmons, passion fruit, and briny Japanese oysters. The 5% ABV Japanese Sansho Ale is a mid-summer’s day dream, endlessly floral, pleasantly bitter, and bursting with the peppercorn’s signature lemongrass-like zing. Sakura Arashi IPA, the 2018 World Beer Awards’ Country Winner for Japan, is also a must-find. Flavored with the leaves of the cherry blossom tree, it’s flush with an intoxicating aroma, followed up by a substantial malt backbone and herbaceous hops. Another 2018 World Beer Award gold medalist, the Oyster Stout, is an 8% ABV heavy-hitter brewed with oyster meat and shells sourced from a nearby saltwater oyster farm. The velvety brew delivers with a punch of toasty bitterness, peppered with tobacco and a distinct, almost nutty minerality -- a prime fireside sipper. At first blush, it might seem like WAKU WAKU’s crisp, sushi-friendly Kanazawa Hyakumangoku Koshihikari Ale is just another generic adjunct beer brewed with a mix of barley and rice to lighten both the body and the cost of production. But in reality, this refreshingly bright brew proves that you don’t need fancy fruit purees or pepper infusions to make a beer that’s both totally unique and distinctly Japanese. Founded in 1999, WAKU WAKU is not just a brewery, but also a working farm, and all the pearly, white Koshihikari rice and biscuity, two-row malt that goes into the ale is all grown nearby. Throw in some imported, woodsy, floral Fuggle and Hersbrucker hops -- the farm started cultivating hops onsite in 2017 but the notoriously finicky crop is not quite ready for regular rotation yet -- yeast, and the prefecture’s celebrated natural hot spring water, and you’ve got a whole lot of golden-hued terroir wrapped up in a sleek, 330ml bottle. And in case you aren’t already convinced this humble crew deserves a gold medal in self-sufficiency, they also installed their very own malting system in a retrofitted barn overlooking their wheat fields down the road. They even constructed a custom malting oven themselves, cutting out the middleman all the way from grain to glass. Like Koshihikari, the rest of WAKU WAKU’s homegrown fleet drinks straightforward and balanced. Other options include a roasty stout dubbed, fittingly, “Dark Ale,” an effervescent Weizen with an earthy, clove-fueled underbelly, and a citrusy, slightly piny Pale exhibiting a juicy mix of mellow bitterness and sweet caramel malt. They’ve been slowly creeping into the US market over the last two years so keep an eye out for a taste of Ishikawa Prefecture at a bar or ramen joint near you. 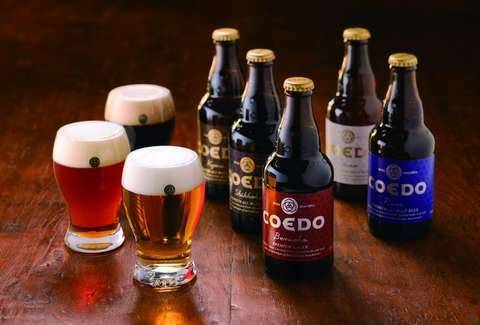 Started by a family with deep roots in organic farming, this popular production brewery has been operating out of a former copy machine company training facility in historic Kawagoe since 1996. Yet despite their back-to-the-land heritage, everything inside the sprawling complex is kept in pristine order, from the sparklingly brewhouse to the spotless bottling room to the color-coded lineup that ranges from a razor-sharp, by-the-book Pilsner to newer styles like a Session IPA and an India Pale Lager. The brewery has always been outspokenly committed to both sustaining and celebrating Japan’s unique agricultural landscape, a mentality that led them to develop what they claim to be the world’s first sweet potato beer, Beniaka. From the outset, they’ve sourced their flagship’s starchy base from local growers, scooping up all sweet potatoes deemed unsellable because of irregular sizes, shapes or other cosmetic flaws and turning them into robust, smooth-drinking amber ale -- kind of like a home for unwanted root vegetables, if you will. Since hitting the selves in ‘96, Beniaka has picked up a bounty of awards including the bronze medal at the Australian International Beer Awards in 2015, 2016, and 2017 as well as a silver at the prestigious World Beer Cup in 2010. At 7% ABV and loaded with rounded stone fruit sweetness, bready malt, and a tart, lingering finish, getting your daily dose of veggies has never been this good. 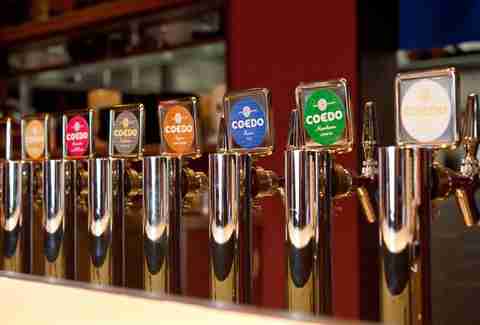 Backed by a supporting cast of German-style classics, hoppy American-influenced numbers, and a few other standouts, Beniaka’s success has helped COEDO expand distribution to 15 different countries including Spain, France, Hong Kong, England, and the US, where San Diego and LA lead the pack. YOHO might be one of the island’s oldest and most famous craft breweries, but that doesn’t mean there’s anything boring about this OG award-winner. The vibrant Nagano facility buzzes with energy, thanks to an enthusiastic, beer-crazy staff and a solid roster of original brews packaged in whimsically designed cans. Their flagship Yona Yona Ale, a hearty American pale ale hopped with piny Cascade (think: Sierra Nevada), dominates the Japanese market, as does Suiyoubi no Neko, or "Wednesday Cat" in English, a soft, herbaceous Belgian Wit spiced with orange peel and coriander and known for the multi-colored cartoon cat peering out from its baby blue label. But stateside, where YOHO has been distributing for seven years, it’s all about the Sorry Umami IPA, a groundbreaking concept brewed expressly for export and fermented with a sprinkling of briny Katsuobushi (AKA smoked bonito fish flakes) for a little unctuous umph. Crazy? Perhaps, but the end result isn’t actually as fishy as you’d expect. The 6.5% ABV ale has a nice tropical fruitiness to it, countered by a wash of sticky, palate-filling malt and a steady, rich bitterness that takes you from one sip to the next. Meredith Heil is a freelance food, drink, and travel writer who's always up for a beer, Japanese or otherwise.